I’ll get right to it: I quit smoking just after Thanksgiving in 2012. Today is January 15th, 2013 and I have absolutely no desire to smoke a tobacco cigarette whatsoever. My secret? NJOY Kings. Yep, e-cigs. They always seemed ridiculous to me, and there are plenty of them out there that are. Some make you hit the thing like you’re taking your last toke off a joint before being sent to the electric chair. Others a bulky and require you to charge them up and push a button to “smoke” them. 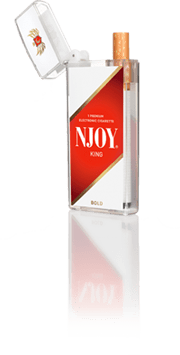 With NJOY, you simply buy it from the store, take it out of the package and start breathing in that nicotine-laced vapor goodness. They’re the same shape, roughly the same weight, and have the same feeling as a smoke. The vapor that comes out coats your throat and feels like hitting a smoke. They cost $8 / pop though from most gas stations and corner stores. When I first switched from real cigarettes to NJOY, I was going through 2 – 3 a day, depending if I was out at the bar or around smokers and hanging out. That’s a hefty daily price for nicotine. But without even trying really, I’ve slowed down to less than one a day. Why? I don’t know about you, but when I want a smoke, it’s typically not because my body’s craving nicotine, but because I want to take a break or because of some trigger (like hopping in my car or having a beer). You smoke an entire cigarette when you really might only want a few drags. With NJOY, you can take one hit or ten at a time, it’s up to you, but I’ve found that hitting it once or twice is all I care for anymore. Thus, you naturally end up hitting it less and less over time. Will I ever ditch NJOY completely? I’m not sure. If the trend continues, I may be down to one a week after a few months, who knows? Either way, I’d rather puff in some flavored water vapor and nicotine than actually breath burning plant material and all of the crazy other additives in cigarettes.